*The Hennessy Backpacker is the most expensive hammock on our list, but it does come with special ‘tree hugger’ straps, which can help to protect the bark of any trees up 42”, that you happen to be pitching up against. The OUTAD is a great introductory hammock tent for people who want to try the experience out on a fairweather trip. It won’t stand up to the kind of elemental abuse of some higher-end hammock tents, but it is waterproof and comfortable. Comes with 2 ropes and 2 carabiners, plus an integrated ‘stuff sack.’ The OUTAD is roomy, with a semi-transparent net on the top, which also doubles as a mosquito net. Simple zipper system for entry, and the whole thing rolls up tightly into its own special carry pouch. Fairweather camping trips and backyard adventures. One of our favourite best camping hammocks. Quick-drying hammock tent with a transparent upper to allow for complete visibility all around. The FOME is your portable hammock home away from home, and is capable of withstanding weights up to 120kg. If you’re looking for something super basic, then the FOME is a great choice. It’s essentially a covered hammock. Capable of holding upto 120kg, the hammock itself weighs just 621g. Large enough to accommodate tall people, the FOME packs away into a neat carry case for easy transportation, and can be clipped onto your rucksack, or stashed away in extra large backpack under compartments. 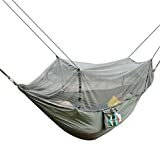 To keep weight and cost down, the FOME is essentially a regular, durable hammock, with a semi-transparent net cover to keep you safe from insects (but not rain.) Super easy to set up and pack away, and supplied with carabiner clip to attach to your rucksack. Made from light and strong nylon, capable of holding upto 120kg. Backyard adventures and camping trips in good weather. The Pellor sets up in minutes and packs away in minutes, with a built-in mosquito net to keep you free from irritating bites. Great for camping away from uneven floors and anywhere where the ground might be unsafe, covered in creepy crawlies and things which might want to eat your supplies. Weighs just 610g and is capable of holding upto 200kg, the Pellor is a real-world physics lesson. Stay safe and secure with a four-way rope tie system, to attach the hammock tent to surrounding trees. Large enough to house tall people quite comfortably. As with most hammock tents, the Pellor is pretty light on features, to help keep cost and weight down. The hammock comes with a built-in mosquito net, and folds away quickly and easily into the attached carry pouch. The Pellor is very durable, you could carry this thing around for years and still have it serve you well. It’s made from high-quality parachute material, so it’s waterproof and flexible, too. Day or weekend camping trips, where the weather is likely to be warm and our number 1 in this best camping hammocks review. No cover on this one, but if you’re in the market for a high-quality hammock to supplement your camping kit, then the Oliver James is perfect. Incredibly strong, supporting upto 300kg, you can rest easy on this one. The cords and hooks are awesome quality and will make an excellent addition to the most discerning camper’s equipment kit. Capable of supporting up to 300kg, the Oliver James is no joke when it comes to hammock strength. Made with the same materials as military parachutes, it’s ultra-lightweight and durable, and weighs less than 600g. High-quality holding cords and hooks are about as fancy as it gets on the Oliver James. Look out instead, for the comfortable, durable, lightweight military parachute material, that’s guaranteed to keep you safe and comfortable. We love the build quality of the Oliver James. It’s constructed using military grade parachute material, that’s capable, along with the hooks and cords, of supporting up to 300kg of weight. Including as part of your long-term, advanced camping and hiking kit. One of our favorite best camping hammocks. We really have saved the best until last. The Hennessy Hammock Ultralite Backpacker Asym is one of the world’s best hanging hammock tents. It’s super light, durable, waterproof, windproof, mosquito proof, you name it. One backpacker from Israel even went 17,000 miles with just a Hennessy Backpacker for shelter. It doesn’t support as much weight as the other hammock tents featured here, but if you’re under 90kg, you’re guaranteed one of the safest, most comfortable hammock-based night’s sleep of your life. We love the Hennessy, and we really recommend it for anyone serious about their travelling and camping. The packed weight of the Hennessy Backpacker is 860g, so not too bad for carrying around. The height limit is 6ft, so you’ll need to be on the average to shorter side to fully enjoy it, and there’s a weight limit of 90kg. As well as a mosquito net cover, the Hennessy also features a separate rain cover, which extends away from the hammock, to help keep rain away from you and your belongings. With an eight-point attachment system, pulling the Hennessy taut from each corner, the hammock is sturdy and windproof, more so than any of the other hammocks we’ve featured. It comes with its own carry case, and some special ‘tree hugger’ straps, so that you can protect the bark of the trees you’re pitching the hammock to. Spectra ropes and polyester Rainfly materials make the Hennessy both light and resistant to the elements. A winning combination in our book. Adding to your expedition kit. Good for longer camping trips and moderate to severe weather conditions. A close contender in our top 5 best camping hammocks review. I was late to the party in using a hammock to go camping but knowing we were trekking through woods I borrowed a friends. 100% recommend the Hennessy its lightweight and a great nights sleep. I’ll go with the mosquito net! I’m easily got bitten by them so that it helps to protect me when going on a camping!